Today, The Irish News – based in Belfast, Northern Ireland –published a letter with two ‘quotes’ by Zionist leaders. The letter (published, for some reason, twice within the last month), which attempts to refute a previous letter praising Israeli democracy, includes the following paragraph, designed to discredit not only Israel’s democracy, but Zionism itself. However, research by CAMERA quite a few years ago clearly demonstrated that the words “We will expel the Arabs and take their place” – suggesting Ben-Gurion favoured the ethnic cleansing of Arabs – represented the opposite of the truth. 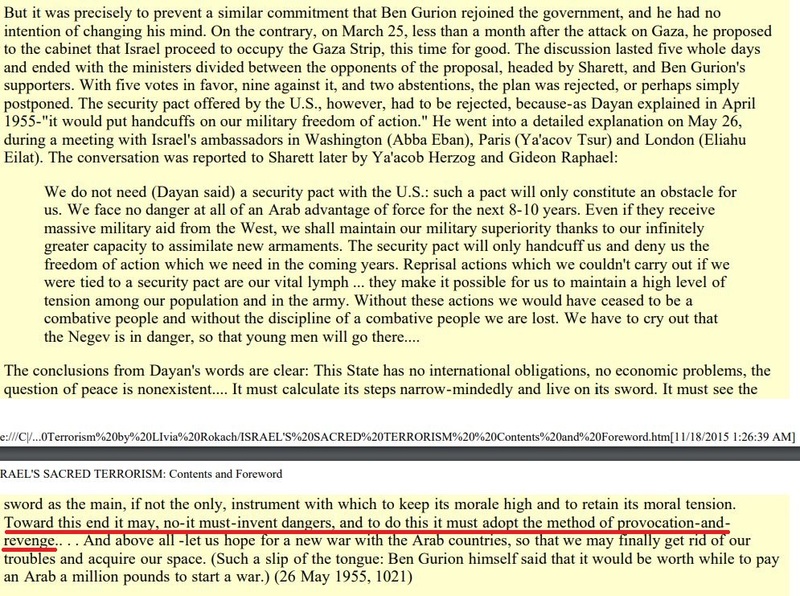 Here’s what Ben-Gurion actually wrote in the letter in question. Here’s the second quote in the Irish News letter, used to suggest that Israel – and not the Arabs – has generally been the aggressor in the region since 1948. Israeli minister General Moshe Dyan stated that: “Israel must invent dangers and to do this it must adopt the strategy of provocation and revenge.” This statement is consistent with every war Israel has fought with the exception of the Yom Kippur war of 1973 when Egypt and Syria attacked Israel to drive them from lands occupied by Israel during the six-day ‘war’. We’ve never seen that quote before, and there were very few references to it online. We were, however, immediately suspicious when even Wikiquote flagged it as a “misattributed quote”. Upon further research, we found that it appeared on a few fringe anti-Zionist sites, but it was usually attributed to the diaries of former Israeli prime minister Moshe Sharett, and framed as Sharett’s personal characterisation of Dayan’s views, not the views of Dayan himself. However, based on our research, it now appears that it wasn’t even Sharett’s characterisation of Dayan’s views. It appears to have originated in a 1980 book by Livia Rokach (with a forward by Noam Chomsky) titled ‘Israel’s Sacred Terrorism’, a book dedicated to “all the Palestinian victims of Israel’s unholy terrorism” and promoted by anti-Zionist and antisemitic sites, such as the Holocaust Revisionist site, ‘Institute for Historical Review’. As you can see, the quote is the writer’s characterisation of Moshe Sharett’s characterisation of Dayan’s views, itself merely based on a conversation between Dayan and two Israeli ambassadors – a meeting that Sharett didn’t himself attend. The words appear to belong to the author of the book, ‘Israel’s Sacred Terrorism’, not Dayan, and not even Sharett. Such fake Zionist quotes demonstrate a broader problem within the UK media: the dissemination of misinformation about Israel by pro-Palestinian activists – in both op-eds and news articles – that routinely goes unchallenged by editors, thus grossly distorting the debate about the Israeli-Palestinian conflict in that country. When you don’t have facts on your side, you just make stuff up. Welcome to the world of ‘pro-palestian’ politics. The Irish media is just as mendacious as the British. “Jews will not replace us” isn’t just a refrain of neo-Nazis and the alt-right movement, but Irish media as well. Man, if I was selling tiki torches, I’d open a warehouse in Dublin. Ain’t that right? You are not an authority on what was said in the press and on videotape. It was very clearly Jews not replacing those sorry, skinny white asses. The idea that “We will expel the Arabs and take their place” is some sort of Zionist ideology is both false and, you know, a total accusation that we Jews go around replacing people. But it’s cute that you want to be taken seriously as you rewrite 3000 years of anti-Semitic tropes as being misunderstood neutral language. Adorbs. Okay, Stanley. Yes, let me watch that videotape again. Let me rewind it and play it back slowly. Is that Jews? or Ewes? Are we sure that small dicked racist white men in America are afraid of being replaced by sheep? I’m sticking with Jews, Stan, because I know what a white supremacist scumbag happens to really think. The left, of course, is NEVER antisemitic. She’s back! Here to remind us all that we don’t say what a pickled hag demands to be said, that you’re better off not saying it at all. It was so nice and quiet while you were passed out for the previous two weeks. Two fake quotes in support of a fake narrative.